In July/August 2016 I visited two countries in southern Africa (Namibia and Botswana), and one country in Central Africa (Zambia). The trip was organized by Go2Africa. I was very happy with the organization, everything worked like clockwork. In Namibia I was driving myself between the various lodges. Driving in Namibia is on the left. I had done that in several countries (England, Ireland, South Africa, Japan), so I had no problem with that. Go2Africa had organized a rental car for me. I had insisted on two spare tires, I didn't want to get stuck with a flat tire on one of the dirt roads. I did have one flat tire. It was a good feeling driving another 150 km (93 miles) with one flat tire, knowing I had another spare. Most of the roads were unpaved roads. Most of them were OK, but one segment was atrocious, it was the worst washboard road I ever drove on. One of my shocks broke on that road. Fortunately the rental car company, Bidvest was very responsive. They arranged to have the tire replaced on a Saturday afternoon when I had the flat tire. And they sent a replacement car right away after the shock broke. It arrived just when I was ready to leave the lodge. I was at first a bit concerned about fuel. I didn't know whether I would get fuel everywhere. As it turned out, the map that I had brought with me had fuel stations marked. On one leg, the guide for another tourist gave me a good advice on fuel for the Etosha National Park, telling me to get fuel in Outjo, before entering the park, since the gas stations in the Etosha National Park are not reliable for having fuel. Everything worked out fine throughout the trip, I didn't have any problems. Go2Africa had made reservations in the various lodges that I visited. For the driving they had prepared a detailed itinerary with pictures of each days driving map, as well as the GPS coordinates of the destination for each drive. This made navigation very easy. Altogether, it was a great experience to drive myself. Namibia definitely is a country where you can drive yourself. After a long flight via Frankfurt, Germany, and Johannesburg, South Africa, I arrived in Windhoek, Namibia in mid-morning. The rental car was all set and I was on my way into Windhoek. I stayed there for one night at the House on Olof Palme, a nice small hotel. They arranged transportation for me to Joe's Beerhouse for dinner. Joe's Beerhouse is a huge restaurant, mostly outside, with great food. It is worth a visit if you are in Windhoek. The next day was the first longer drive, about 310 km (193 miles), less than 5 hours, from Windhoek to the Sossusvlei Lodge in Sesriem. I stayed at the Sossusvlei Lodge for three nights. The Namib Sand Sea around Sossusvlei is a UNESCO World Heritage Site. The Sossusvlei Lodge was fantastic. The food was excellent. For dinner they had a salad bar that was the best I have ever seen. Then they had a grill where you could select from local meats (Oryx, Springbok, Zebra, etc) or regular beef or chicken, and have it grilled to your liking. It was super. This was overall the best lodge in Namibia. I had three excursions, one to Sossusvlei and Deadvlei, one to Sesriem Canyon, and a Sundowner excursion. I had also booked a balloon flight for one morning. Unfortunately, it was too windy for the balloon, so it was canceled. The excursion to Sossusvlei and Deadvlei was fantastic, it is well worth a visit. 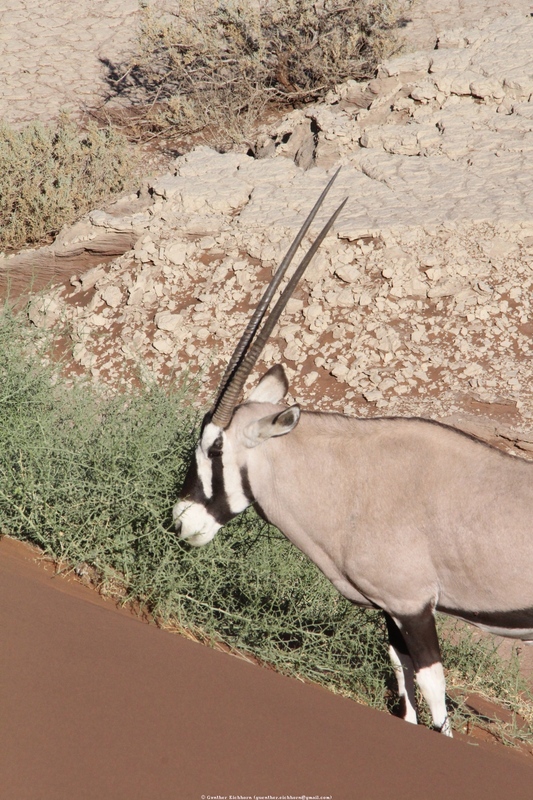 We saw lots of Gemsbok (Oryx gazella, german: Spießbock, french: Oryx gazelle) and Springbok (Antidorcas marsupialis, german: Springbock, french: Springbok). The scenery is great, and the hike up the dune is really fun. The Sesriem Canyon is interesting to visit, it is a fairly short excursion. It is a 30 m (100 ft) deep canyon a short distance from Sesriem. The Sundowner excursion was a drive into the desert, with drinks and a snack while watching the sunset. We saw some wildlife during this excursion, including a Bat-eared Fox (Otocyon megalotis, german: Löffelhund, french: Renard à oreilles de chauve-souris). It was a nice relaxing excursion. The lodge is near the the Naukluft National Park. There is plenty of wildlife in the lodge, the Gemsbok wander around between the buildings. Ostrich and Springbok were all around the lodge. 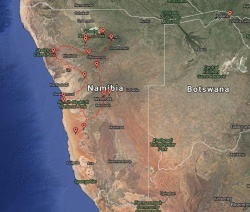 The next day driving was from Sossusvlei Lodge to Swakopmund. It was about 345 km (214 miles), less than 5 hours driving. On this drive I had a flat tire. On the way I stopped in Walvis Bay to watch Flamingos. In Swakopmund I stayed at the Cornerstone Guest House, another nice, friendly little hotel. In Swakopmund I had to get a permit to visit the Welwitschia Plains. I got there just in time before they closed for the weekend. The next day I drove to Welwitschia Plains. From there I drove through little back roads to get to the next destination, the Erongo Wilderness Lodge, about 250 km (155 miles) away. On this drive I had to go through a lot of gates. On the first gate I didn't know how to handle it, I was reluctant to drive onto private property.I finally realized that I just open the gate, drive through, and then close it behind me. This is normal in these areas. The Erongo Wilderness Lodge is another very nice lodge, with very comfortable accommodations and great food. I stayed there for one night. I had a nice excursion in the afternoon, seeing Rock Hyraxes (Procavia capensis, german: Klippschliefer, french: Daman du Cap), and impressive rock paintings. The next days driving was the longest, about 380 km (236 miles), more than to the Desert Rhino Camp near Palmwag. This was the worst road on the trip, one of my shocks broke on that road. The rental car company brought a replacement, ready for me when I continued after the stay at the Desert Rhino Camp. I stayed at the camp for two nights, with two excursions every day. During one excursion we walked to within about 100 m (330 ft) of a Black Rhinoceros (Diceros bicornis, german: Spitzmaulnashorn, french: Rhinocéros noir). It was very impressive. The next drive was about 300 km (190 miles), about 4 hours to the Taleni Etosha Village. Taleni Etosha Village again was a very nice lodge, with separate buildings for each guest group. I stayed there for two nights. It was very nice, but not quite as luxurious as Sossusvlei Lodge. The excursions however were quite expensive, about $40 for each excursion. With two excursions per day, that adds up over two days. But the wildlife was fantastic, the most exciting were Lions (Panthera leo, german: Löwe, french: Lion). I saw a pair of mating lions only about 20 m (70 ft) away. The next drive was a short one, only about 165 km (103 miles), less than 3 hours to the Mokuti Etosha Lodge. I stayed there for three nights. This was the worst of the lodges on this trip. The rooms were regular hotel rooms, not separate buildings as at the other lodges. The food was OK, but by far not the same selection or quality as at the other lodges. The worst part was the fact that they didn't run all the excursions. I stayed there for three nights, but got only on two excursions, both were the shorter afternoon excursions. The excursions are only three hours, with about 1.5 hours spent driving to and from the park, so there was not much game viewing. The excursions were quite expensive at about $40. They did not let me on any of the morning excursions. They were lying to me about the reason for that, one person said they were booked out, another person said that the car was being repaired. I was very disappointed with this lodge. Overall, I cannot recommend this lodge. The next drive was longer again, about 350 km (217 miles) to Okonjima Plains Camp in the Okonjima Nature Reserve. From Etosha on, all roads were paved, except about 20 km (12 miles) from the main road to the Okonjima Plains Camp. Since the driving was all on paved roads, it was less than 4 hours to get to the camp. The Okonjima Plains Camp was another one of the very luxurious lodges. The accommodations were great. My room had a huge bay window looking over the reserve. The food was excellent. I stayed only one night at the camp. I had one excursion in the afternoon after I arrived to see Cheetahs (Acinonyx jubatus, german: Gepard, french: Guépard), and another excursion the next morning before I left for the last day of driving to see African Wild Dogs (Lycaon pictus, german: Afrikanischer Wildhund) and Leopards (Panthera pardus, german: Leopard, french: Léopard). The big advantage of the Okonjima Nature Reserve is the fact that many of their top attractions wear radio collars (Leopards, Cheetahs, African Wild Dogs), so they can reliably find them. You are almost guaranteed to see the top predators in the reserve. I can really recommend this place. The next day I drove back to Windhoek to stay the last night at House on Olof Palme. It was a shorter drive of about 220 km (137 miles), 2.5 hours on good paved roads. The next morning a returned to the airport very early for a flight to Botswana, to continue the trip with a 10 day tented safari in Botswana, followed by five days in Zambia. After Zambia, I returned to Namibia to spend two nights on the Chobe Princess Houseboat on the Chobe River, followed by two nights at the Ichingo Chobe River Lodge on Impalila Island. I did two excursions on boats every day during this time, plus a walking excursion on Impalila Island. The bird life on the Chobe River and the Zambezi River is great. For instance I saw a Black Heron (Egretta ardesiaca, german: Glockenreiher, french: Aigrette ardoisée) for the first time. The accommodations on the houseboat were very nice, the food was great. The accommodations at the lodge were again very nice, just like most of the other lodges, with great food. At the end I flew from Kasane to Johannesburg, and from there returned back home. Namibia was fantastic. The wildlife is extraordinary. The landscape is fascinating. Food and accommodations were, with one exception, extremely good. Self driving was easy, I had no problems at all. The country is well worth a visit.